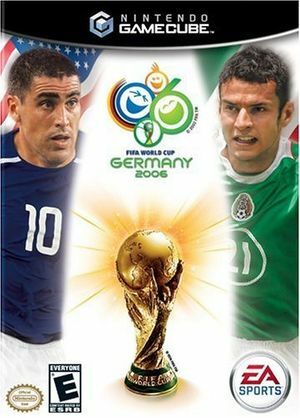 FIFA World Cup: Germany 2006 (known as 2006 FIFA World Cup in Europe) is the official video game for the 2006 FIFA World Cup, published by EA Sports. The game allows players to participate in the 2006 FIFA World Cup held in Germany by taking control of one of 127 national teams. Since the release of the game 2002 FIFA World Cup, the menus have been redesigned and have more options. It even includes a satellite map when choosing countries to play in a Friendly. FIFA World Cup: Germany 2006 uses the VP6 video codec, common in Electronic Arts' titles, causing it's videos to have vertical line artifacts and other glitches on NVIDIA graphics cards. The Software Render will display VP6 video correctly, but is typically too slow. Prior to 4.0-593 video output was completely scrambled, refer issue 5046. Rendering improved with 4.0-593 but a variety of glitches remain, refer issue 7193. VP6 rendering also reacts poorly to the Force Texture Filtering enhancements (and Anisotropic Filtering on NVIDIA), causing further scrambling. The graph below charts the compatibility with FIFA World Cup: Germany 2006 since Dolphin's 2.0 release, listing revisions only where a compatibility change occurred. This page was last edited on 25 July 2018, at 00:57.